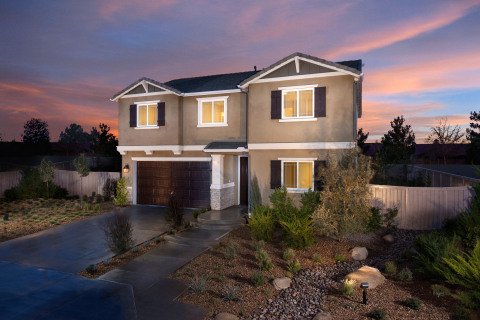 LANCASTER, Calif.--(BUSINESS WIRE)-- KB Home (NYSE: KBH), one of the nation's largest and most recognized homebuilders, unveiled its first ZeroHouse 2.0 in Los Angeles County today during a special event at the builder's Dawn Creek community in Lancaster. The newest ZeroHouse 2.0 is the first KB home designed to achieve both net-zero energy status, and zero freshwater irrigation use by a family of four or more. Dubbed the "Double ZeroHouse" for its dual emphasis on energy and water efficiency, the home is equipped to recycle drainwater on-site and reuse it for landscaping, minimizing the home's overall demand for new water and eliminating the household's need to use freshwater for the home's established low-water landscaping. KB Home celebrated the debut of its Double ZeroHouse 2.0 with an educational event this morning at Dawn Creek, where students studying solar technology at the University of the Antelope Valley were treated to presentations by officials from the City of Lancaster, the State of California, KB Home and its supplier partners. "We laud KB Home for the environmental leadership and performance achieved by its ZeroHouse 2.0 model," said David Hochschild, commissioner of California's Energy Commission, who was present at this morning's ceremony. "KB Home's extensive sustainability initiatives have already led to the construction of thousands of solar powered homes and millions of dollars in energy savings for its customers. The cooperation of KB Home and businesses like it will be instrumental as we continue the important work of building a better, more energy-efficient California." The first-of-its-kind KB home features an advanced water recycling system, a water recycling dishwasher, a "greywater" heat recovery system, super-efficient air ventilation and purification systems as well as a "fuel forward" garage with both an EV charger for electric and hybrid vehicles and a CNG fueling station for natural gas powered cars. Each of these efficiency options is available for homebuyers to select at the KB Home Studio as part of the builder's signature Built to OrderTM experience for its new homes. The home's water recycling system treats greywater from bathroom showers, tubs, sinks, and washing machines to near-potable quality, and reuses it on the landscape. KB Home's ZeroHouse 2.0 at Dawn Creek is the builder's first to showcase this cutting-edge technology that, according to manufacturer's estimates, can help a family of four recycle up to 40,000 gallons of water annually. "Driven by an industry-leading commitment to sustainability, KB Home has succeeded in building our most water- and energy-efficient ZeroHouse 2.0 to date at Dawn Creek," said Tom DiPrima, executive vice president of KB Home's Southern California division. "With drought conditions currently affecting every corner of California, KB Home recognizes the importance of embracing innovations like the advanced greywater recycling system demonstrated in this ZeroHouse 2.0 that leverage the technology of the future to address the problems of today." Water-recycling technology is also featured in the home's dishwasher, which uses 33% less water than other highly-efficient dishwashers by saving water from the last rinse cycle for use in the first pre-rinse cycle of the next load. In addition to its ability to recycle water on-site, KB Home's Double ZeroHouse 2.0 at Dawn Creek employs a variety of state-of-the-art energy-efficient elements that team up and make it a net-zero-energy home. For example, enhanced insulation and sealants help maintain desired internal temperatures, and advanced heating and cooling systems minimize the home's energy use while also creating a comfortable climate inside. The home's greywater heat recovery system extracts energy from drainwater and uses it to preheat water in the home's tankless water heater, further reducing water heating costs. Two specialized systems in KB Home's Double ZeroHouse 2.0 can work ‘round the clock to optimize the home's indoor air quality. An advanced ventilation system introduces fresh outdoor air into the home, while a whole-home air purification system combines patented electronic technology with a highly efficient filter to significantly improve indoor air purity and increase airflow. With the inclusion of solar technology, these and other components of KB Home's Double ZeroHouse 2.0 together contribute to an estimated $4,452 in energy and water savings annually. The ZeroHouse is connected to real-time water and energy monitoring systems that can track the water and energy used by the house conveniently from smart phones and tablets. Home automation technology included in the home puts the power to control its lighting, thermostat and security functions at its owners' fingertips, and the home's ‘smart' refrigerator further reduces the home's demand for energy by shifting energy-intensive functions to off-peak times. All KB homes, even those that are not at the Double ZeroHouse 2.0 standard, are ENERGY STAR® certified with WaterSense labeled faucets and fixtures that can potentially translate into significantly lower utility bills for KB homeowners. KB Home's Double ZeroHouse far exceeds WaterSense and ENERGY STAR efficiency standards, is Indoor airPLUS certified, and meets the Department of Energy's rigorous Challenge Home program's requirements for energy savings, comfort, health, durability, quality and future performance. The City of Lancaster, where KB Home's Double ZeroHouse 2.0 is located, is committed to becoming the Alternative Energy Capital of the World, as well as the nation's first Net-Zero City. The City's ongoing partnership with KB Home provides the potential to improve energy conservation and efficiency within California, while strengthening Lancaster's reputation as a premier authority on municipal alternative energy. "KB Home's groundbreaking efforts to incorporate the latest water- and energy- saving technology into homes have been simply astounding," said City of Lancaster Mayor R. Rex Parris. "This management team is extremely proactive. They knew the technology was out there and rather than waiting for someone to map it out for them, they blazed the trail, discovering how to implement this wonderful energy-saving, clean power-producing equipment into their homes. These are exactly the type of partners we need in our journey to become the nation's first Net-Zero City." In recognition of his pivotal role in developing this tremendously successful partnership between KB Home and Lancaster, Mayor Parris presented Tom DiPrima, executive vice president of KB Home's Southern California division, with a key to the City. KB Home's ‘Double ZeroHouse 2.0' at Dawn Creek is now open in Lancaster. For more information, visit www.kbhome.com or call 888-KB-HOMES. KB Home is one of the largest and most recognized homebuilding companies in the United States. Since its founding in 1957, the company has built more than half a million quality homes. KB Home's signature Built to Order™ approach lets each buyer customize their new home from lot location to floor plan and design features. As a leader in utilizing state-of-the-art sustainable building practices, all KB homes are highly energy efficient and meet strict ENERGY STAR® guidelines. This helps to lower monthly utility costs for homeowners, which the company demonstrates with its proprietary KB Home Energy Performance Guide® (EPG®). KB Home has been named both an ENERGY STAR Partner of the Year Sustained Excellence Award winner and WaterSense® Partner of the Year for three consecutive years by the EPA. Los Angeles-based KB Home was the first homebuilder listed on the New York Stock Exchange, and trades under the ticker symbol "KBH." For more information about KB Home's new home communities, call 888-KB-HOMES or visit www.kbhome.com. The City of Lancaster is a thriving community of more than 158,000 located in northern Los Angeles County. Clean air, affordable housing, wide open spaces, and a close-knit community make Lancaster an ideal place for families. A low cost of doing business, endless potential for growth, and a strong commitment to business from local leaders has twice earned Lancaster the Eddy Award for "Most Business-Friendly City" in Los Angeles County from the Los Angeles County Economic Development Corporation. In addition, Lancaster boasts more than 300 days of sunshine per year, making it the ideal place to pioneer new solar energy technologies. No matter how you look at it, it's positively clear that Lancaster is the perfect place to live, work and play.